Nikolai Egorovich Zhukovsky was born on the 17th of January 1847. His father was an engineer, one of the constructors of the Nizhniy Novgorod railway. After the boy had graduated from the gymnasium with a golden medal, he entered the Moscow University, faculty of applied mathematics. In 1868 he graduated from university and in 1870 started working as a physics teacher at one of the Moscow gymnasia for women. In 1872 he started teaching mathematics at Emperial Technical School where he worked for the rest of his life. Zhukovsky`s master’s thesis entitled Kinematics of Fluid Body was his first contribution in hydrodynamics. He was a pioneer in research of kinematics and descriptive-geometric side of movement of elements in liquids. Zhukovsky was the first to find a formula that let him reckon movement of every element of a moving flow of liquid. 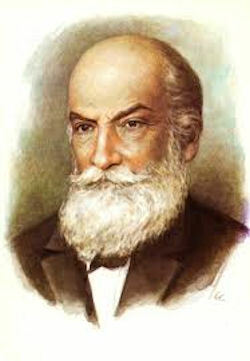 Zhukovsky started deep research on movement of air flows and later he created a new branch of science called aerodynamics. The Technical School Council appointed him a professor for the mechanics department and in 1888 – for applied mathematics at university. For a hundred years theorists and experimenters had studied to create the optimal shape of the screw propeller. Zhukovsky created his famous Vortex Theory of Screw Propeller and brought the disputes to an end. In 1892 he published an article explaining how birds were able to bangle with their wings spread and proved theoretically that it was possible to construct artificial mechanisms for bangle. In 1897 he published an article entitled About the Most Optimal Slope Angle of Airplanes. In 1898 Zhukovsky published his seminal “On aeronautics” and in 1904, he set out the law on aircraft wing lift. Zhukovsky is recognised as the progenitor of Russian aviation as a result of his numerous scientific discoveries in this field. In 1904 the world’s first institute for aerodynamic research was created based on Zhukovsky`s laboratory. He discovered the principles of how airplanes flew based on the upper and lower jet streams and worked out a formula allowing mathematic design for any aircraft. In 1910 Zhukovsky founded an aerodynamic laboratory at the Moscow Technical School where he researched airscrews and methods of mathematic design for aircraft. During the war of 1914-1918 Zhukovsky`s laboratory turned into a designing-testing bureau for testing the aerodynamic qualities of the aircraft that Russia only started to construct. Before the war Zhukovsky organized an aviation course at the same technical school where he was the first in the world to start reading lectures about the theoretic basics of aeronautics. In 1918 the course was transformed into Moscow Institute of Air Fleet Engineers, that later turned into Air Fleet Academy named after Zhukovsky. In 1918 there was also created Central Institute of Air and Water Dynamics, that later became a large centre for scientific research in the sphere of aircraft engineering. By an idea and initiative of Zhukovsky there was also created Moscow Aviation Institute. In September 1919 on the initiative of prominent Russian scholar Nikolai Yegorovich Zhukovsky, there was established the Moscow Aviation Technical College. In July 1920 the aviation college was transferred under the authority of the Chief Directorate of the Red Air Fleet. On September 26 1920 Revvoyensovet of the Republic in response to the petition submitted by the aviation college’s council, in commemoration of the 50th anniversary of scientific work of N.Ye. Zhukovsky, “who has been contributing his strength and expertise to the Air Force from its very foundation and brought up the young generation of engineers and scientists”, decided to reorganize the Moscow Aviation Technical College into the N.Ye. Zhukovsky Institute of Engineers of the Red Air Fleet. The Regulations on the Institute were approved by Revvoyensovet on November 23 1920. The order on the foundation of the institute and regulations completed the establishment of this higher military aviation institution, whose rector became Zhukovsky. In 1920 Zhukovsky fell ill with pneumonia shortly after which he was paralyzed and also caught typhoid fever. On 17 March 1921 Nikolai Zhukovsky died. N.E. Zhukovsky imparted great knowledge and fortitude to his students, and to Russia — dozens of outstanding minds and the ability to soar above the clouds. A.N. Tupolev, B.S. Stechkin, A.A. Archangelsky, S.A. Chaplygin, B.N. Yuriev, V.P. Vetchinkin and many other founders and disciples of domestic science and advanced aviation equipment were formed here, in building #17 on Ulitsa Radio.